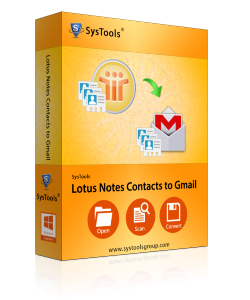 To convert Lotus Notes contacts to Gmail the tool first spontaneously scan the added file, and as scanning ends, it instantly provide the preview of all stored contact with diverse properties to the user. Will this software convert contacts from Notes file into Gmail directly? No. The software will merely convert contacts to Comma Separated Value file after which the file needs to be imported in Gmail application. Is Lotus Notes installation compulsory for this application to run? Yes. In order to utilize this tool, your system needs to have installed Lotus Notes email application. Is this tool capable to convert more than 1000 contacts from NSF file? Yes, Notes Contacts to Gmail software can convert any number of contacts stored in the file at once. Is this software effective with all versions of Lotus Notes? Yes. Software supports all the versions of Lotus Notes including 6.0, 7.0, 8.5, & 9.0 for conversion. Can I convert contacts from many several names.nsf file at once? Software supports single file at a time and you can add only one file. But if you want to convert multiple files, you can add all of them one by one to the software.